When I returned to London, I hung out with my friend for a bit but I developed a serious allergic reaction to sleeping on her couch. After some investigation, we realized that the previous owner had cats which was why I had started wheezing. Luckily I was able to go to the doctor and pick up anti-histamines. I couldn’t stay with my friend any longer but I was finally able to get in touch with my cousin who offered to let me stay with him and his family. Wimbledon is the Holy Grail of tennis and it lived up to my expectations even though I did not make it unto Center Court. The first day I went to Wimbledon, I was discouraged by the long lines streaming around the block, so I just explored Wimbledon Village. Mid-way through exploring, I gave myself a stern talking: you are in London, you have to try; when you go home, you’ll think back on it and regret that you didn’t even queue! So, the next day, I got up early, took the 1 hour bus ride from my cousin’s house, and got to Wimbledon at 9 AM. Mercifully, the queue was amazingly organized, unlike the epic fail of the French Open–I stood in line for 3 hours only to get to the front and have the line disintegrate as there was massive confusion about whether there actually were tickets available while the guards negotiated with scalpers! As the English ladies in Paris told me, Wimbledon is much more civilized and it was! They gave you a queue card so that you knew your place in line, they constantly updated you on how long the wait would be, and you were allowed to sit on the grass until the wait was about 1 hour at which point you started walking slowly to the front of the gate. I would never mind queuing if all were this organized. I contemplated queuing overnight just to get on Center Court but wasn’t ready to do it on my own! Maybe next time. I queued and spent 5 glorious days at Wimbledon; Tuesday – Thursday of the first week & Monday -Tuesday of week two. On day 3: I was very bad and did some coach stalking of Dimitri Zavialoff, Stan Wawrinka’s coach! I spotted Dimitri when I went to Birmingham to catch the Davis Cup tie against the US. He and I were waiting for transportation from the airport. He had tennis rackets and a Swiss jacket, so I knew he was in town for the same thing, but I assumed he was a practice partner. He was totally casual and no frills. I continued to check him out whenever I could all weekend until I got home and a TV commentator identified him as Stan’s coach. I just think he’s hot. I wandered around Wimbly, taking in the grounds and caught Stan practicing. I unabashedly stopped and ogled them both. 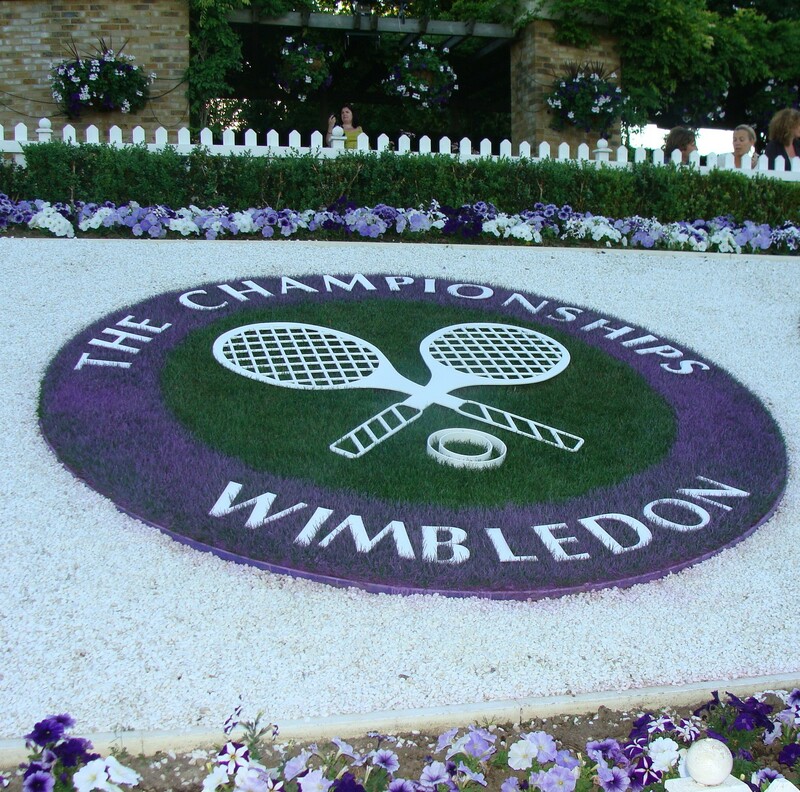 The grounds at Wimbledon are perfectly captured in pictures, oh the manicured lawns and the green & purple! Access to players (not the top guys) was as easy as Eastbourne, particularly on the side courts. Everywhere I turned someone was either practicing or engaged in a match. Of course, I saw Verdasco play; I seem to spot Verdasco everywhere I go. I fear poor Verdasco’s team must think I’m stalking him. I did just sit behind his dad at Halle! I did all the musts at Wimbly: ate strawberries & cream; ventured to Murray’s Mound (or is that Henman Hill?) and just soaked up the atmosphere. This is a must do tournament for any tennis lover.